Treasure hunting is always a fun concept, for kids and adults alike. I know it can keep my kids engaged for quite some time, as long as it is fun. Apparently, looking for shoes before school in the morning doesn't count as a fun treasure hunt though! Find It has brought a large treasure hunt to the palms of our hands! 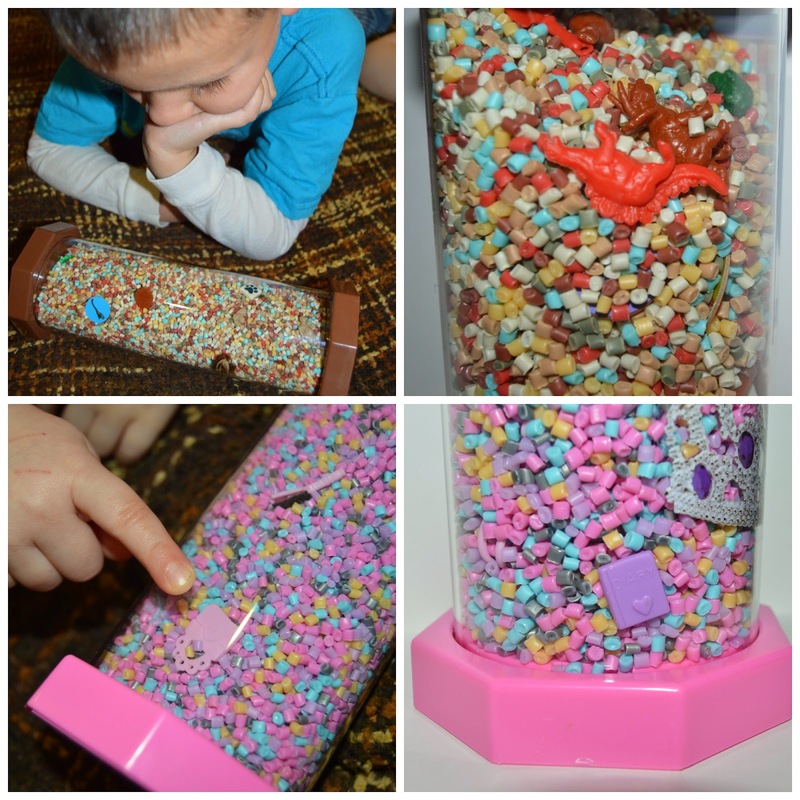 Find It is a tube filled with colored plastic pellets, but the kicker is what you find mixed in with those pellets. From princess crowns to dinosaur eggs, and even pennies - the 'treasure' abounds! Keep reading to see what else Find It offers and where to get it! Each tube has over 40 unique objects to find that match the theme of the game, and the pellets are colored to compliment the themes as well. At one end of the tube is a list of items to try to find throughout the tube of wonder. You can roll it any which way, give it a shake or even rock it side to side like you would an hour glass. We received the Find It Glitz and Glamour to review and also the Find It Dino. My kids have had so much fun with them! They have taken them in the car when we take a trip to the mountains, Jayde even took hers in the shower once! I don't recommend them as a shower toy though, as the list at the top of the tube has now peeled off. I just could not get her in the shower without it that night! Find It also offers other treasure hunt style games. One of which is Tiny World Dinosaurs. You get a tiny microscope and a few cards with tiny drawings. Use the microscope to find all of the little drawings on the cards! You can find the Find It games at store like Target and Barnes & Noble, as well as on the Find It website. These treasure hunts to go would make for an awesome gift to provide hours of fun to all ages, and it would be a great staple for a family game night! Visit the Find It website here!